NEW YORK, June 19 (Reuters) - U.S. stocks rose on Tuesday on hopes that the Federal Reserve's policymakers will agree on extending stimulus measures as the economy struggles to recover. A sharp decline in German business sentiment, alongside stubbornly high Spanish bond yields, raised expectations for market-friendly stimulus from European policymakers as well. "We went to the highs of the day on that, and we have the Fed tomorrow. This is a bailout, central bank largesse bounce, and we'll see what follow-through (occurs) after the Fed tomorrow and whatever becomes of the ESM," said Peter Boockvar, equity strategist at Miller Tabak & Co in New York. British media reports earlier had said German Chancellor Angela Merkel was poised to use Europe's dual bailout funds, known as the European Financial Stability Facility or the EFSF and the European Stability Mechinism or the ESM, to buy up the debt of countries like Italy and Spain and had discussed the plans at the summit. But a German government official told Reuters there was no discussion at a G20 summit in Mexico this week about using Europe's rescue funds to buy up the bonds of stricken members of the euro zone. The Dow Jones industrial average was up 112.20 points, or 0.87 percent, at 12,854.02. The Standard & Poor's 500 Index was up 14.27 points, or 1.06 percent, at 1,359.05. The Nasdaq Composite Index was up 35.10 points, or 1.21 percent, at 2,930.43. The S&P 500 has gained more than 7 percent from a five-month low hit earlier in June, and is on track to close above its 50-day moving average for the first time in seven weeks. But the sharp gains also leave the market vulnerable if the outcome of Wednesday's Fed meeting doesn't meet market expectations. Growth-related stocks led the rally, with the S&P materials sector index up 2 percent and the financial sector index up 1.7 percent. U.S. Steel Corp jumped 7.6 percent to $19.80 and Bank of America added 4.6 percent to $8.12. On Tuesday, the Federal Open Market Committee began the first day of a two-day meeting on interest-rate policy. The meeting got under way with expectations increasing that the U.S. central bank may extend its "Operation Twist" program, its effort to drive down long-term borrowing costs. "People are anticipating some type of response from the Fed tomorrow and are buying or covering shorts in anticipation of that," said Paul Zemsky, head of asset allocation at ING Investment Management in New York. "There's a risk the market gets disappointed." Spain's government bond yields eased slightly after it raised 3 billion euros at a short-term debt sale, with the higher yields enticing investors. However, with its 10-year bond yield above 7 percent, investors worried over how long the euro zone's fourth-largest economy can survive without foreign help. In Greece, parties promised to form a coalition government soon and seek concessions from the country's EU and IMF lenders on an austerity program that is both keeping the country away from bankruptcy and mired in a very long recession. Oracle Corp rose 3.3 percent to $28.01 a day after it reported stronger-than-expected quarterly profit, releasing the results three days ahead of schedule after news of the pending departure of a senior sales executive fueled concerns that business was stagnating. Walgreen Co tumbled 5.6 percent to $30.17 after the pharmacy chain reported quarterly earnings and said it would buy a 45 percent stake in Alliance Boots for $6.7 billion in a cash-and-stock deal. FedEx Corp rose 3 percent to $91.17 after the package delivery company reported fourth-quarter earnings and provided an outlook for the first quarter and 2013. Shares of J.C. Penney dropped 8.3 percent to $22.30 a day after its president abruptly left the department store operator following a botched advertising campaign. NEW YORK (Frankfurt: A0DKRK - news) , June 19 (Reuters) - U.S. stocks rose on Tuesday on hopes that the Federal Reserve will agree to extend stimulus measures as the economy struggles to recover and the euro zone's debt crisis gets worse. The S&P 500 has gained 7.2 percent from a five-month intraday low reached on June 4. On Tuesday, the benchmark index closed above its 50-day moving average of 1,346.90 for the first time in seven weeks. But the sharp gains leave the market vulnerable if the outcome of Wednesday's Fed meeting doesn't meet market expectations. "People are anticipating some type of response from the Fed tomorrow, and are buying or covering shorts in anticipation of that," said Paul Zemsky, head of asset allocation at ING Investment Management in New York. "There's a risk the market gets disappointed." Growth-related stocks led the rally, with the S&P materials sector index up 2 percent and the financial sector index up 1.7 percent. U.S. Steel Corp jumped 9.5 percent to $20.15. Bank of America (NYSE: IKJ - news) added 4.5 percent to $8.11. Markets kept a wary eye on developments in Europe (Chicago Options: ^REURUSD - news) . A sharp decline in German business sentiment, alongside stubbornly high Spanish bond yields, raised expectations for stimulus from European policymakers as well. British media reports earlier said German Chancellor Angela Merkel was poised to use Europe's dual bailout funds, the European Financial Stability Facility and the European Stability Mechinism, to buy debt of countries like Italy and Spain. A German government official told Reuters there was no discussion at the G20 summit in Mexico about using Europe's rescue funds to buy the bonds of stricken members of the euro zone. The Dow Jones industrial average gained 95.51 points, or 0.75 percent, to 12,837.33 at the close. The Standard & Poor's 500 Index advanced 13.20 points, or 0.98 percent, to 1,357.98. The Nasdaq Composite Index rose 34.43 points, or 1.19 percent, to close at 2,929.76. Spain's government bond yields eased slightly after it raised 3 billion euros at a short-term debt sale, with the higher yields enticing investors. However, with its 10-year bond yield above 7 percent, investors worry how long the euro zone's fourth-largest economy can survive without foreign help. Oracle Corp rose 3.1 percent to $27.96 a day after it reported stronger-than-expected quarterly profit, releasing the results three days ahead of schedule after news of the pending departure of a senior sales executive fueled concerns that business was stagnating. Walgreen Co (NYSE: WAG - news) tumbled 5.9 percent to $30.09 after the pharmacy chain reported quarterly earnings and said it would buy a 45 percent stake in Alliance Boots for $6.7 billion in a cash-and-stock deal. FedEx Corp (NYSE: FDX - news) rose 2.8 percent to $91.01 after the package delivery company reported fourth-quarter earnings and provided an outlook for the first quarter and 2013. Shares of J.C. Penney dropped 8.5 percent to $22.25 a day after its president abruptly left the department store operator following a botched advertising campaign. Volume was light, with about 6.7 billion shares traded on the New York Stock Exchange, the American Stock Exchange and the Nasdaq, below last year's daily average of 7.84 billion. NEW YORK, June 19 (Reuters) - World stocks rose more than 1 percent and the euro gained on Tuesday amid optimism the world's major central banks will provide more economic stimulus as the euro zone crisis worsens. The U.S. Federal Reserve on Tuesday begins a two-day policy-setting meeting with investors focused on whether it will unveil any more stimulus to support the lackluster recovery. Analysts expect the Fed to extend its long-term bond-buying through "Operation Twist" by a few months from the current deadline of June. Expectations of further stimulus from the Fed pressured the U.S. dollar across the board. Investors have been worried about the impact of the euro zone crisis on the global economy, particularly as the U.S. economy appears to be losing momentum. U.S. stocks rose more than 1 percent, while world stocks, as measured by the MSCI's all-country world equity index climbed 1.2 percent. The euro gained 0.5 percent on the day at $1.2640 after hitting session highs of $1.2647. "People are anticipating some type of response from the Fed tomorrow and are buying or covering shorts in anticipation of that," said Paul Zemsky, head of asset allocation at ING Investment Management in New York. A surprise fall in British inflation strengthened the chance of steps from the Bank of England to support the UK economy as it feels the heat of the euro zone's problems. Growth-related stocks led Wall Street's rally, with the S&P materials sector up 1.7 percent and the financial sector up 1.5 percent. U.S. Steel Corp jumped 5.4 percent to $19.41 and Bank of America added 4.8 percent to $8.13. The Dow Jones industrial average was up 120.18 points, or 0.94 percent, at 12,862.00. The Standard & Poor's 500 Index was up 13.99 points, or 1.04 percent, at 1,358.77. The Nasdaq Composite Index was up 34.32 points, or 1.19 percent, at 2,929.65. The pan-European FTSEurofirst 300 added 1.6 percent while Spain's IBEX rose 2.7 percent. At the same time, concern mounted over a sharp rise in Spain's short-term borrowing costs, a big fall in German investor confidence and Greece's commitment to its bailout plan. Spain came closer to becoming the largest euro zone country yet to be shut out of credit markets when it had to pay a euro era record price to sell short-term debt. The euro zone's fourth largest economy, Spain had to pay 5.07 percent to sell 12-month Treasury bills and 5.11 percent to sell 18-month paper - an increase of about 200 basis points on the last auction for the same maturities a month ago. Yields on longer-term bonds are over 7 percent. On Monday, initial enthusiasm over a weekend victory for pro-bailout parties in Greek elections gave way to worry about the nagging debt crisis still facing the euro zone. In the oil market, Brent crude rebounded from near a 17-month low. Brent crude futures were up 48 cents at $96.53 a barrel, while U.S. crude was up 76 cents at $84.03. U.S. Treasury prices fell as some investors closed out profitable positions before the start of the Fed meeting. U.S. benchmark 10-year notes were last down 12/32 in price to yield 1.61 percent, up from 1.57 percent late on Monday. Asian stocks rose to a one-month high and the won strengthened for a sixth day after data showed Japanese imports soared last month and before the Federal Reserve announces whether it will take new steps to boost the economy. The euro pared gains and oil declined. The MSCI Asia Pacific Index rose 0.9 percent at 11:22 a.m. in Tokyo, while Standard & Poor’s 500 Index futures dropped 0.2 percent. South Korea’s currency gained 0.2 percent to 1,153.70 per dollar in its longest rally since January. The euro fell 0.3 percent to 99.86 yen and New Zealand’s dollar lost 0.4 percent to 79.52 U.S. cents. Oil dipped 0.2 percent to $83.90 a barrel. Japan’s need for energy imports climbed in May after the world’s third-biggest economy shut nuclear plants following last year’s earthquake that triggered meltdowns at a facility in Fukushima. The U.S. central bank is expected to announce added stimulus measures as soon as this week’s meeting, according to 12 of the 21 primary dealers who trade with the Fed. The euro’s weakness comes before Spanish bond auctions tomorrow, which may cast doubt over the country’s funding capabilities. About three stocks rose for every one that fell on the MSCI Asia Pacific (MXAP) Index. Japan’s Nikkei 225 Stock Average gained 0.8 percent, while South Korea’s Kospi index rose 0.3 percent. Hong Kong’s Hang Seng index advanced 0.5 percent. Japan’s trade deficit was 907.3 billion yen ($11.5 billion) in May, the Finance Ministry said in Tokyo today. The median forecast in the survey was for a 544.4 billion yen shortfall. Exports rose 10 percent from a year earlier, while imports climbed 9.3 percent, both wider than economists had estimated. Sumitomo Mitsui Trust Holdings Inc. (8309), Japan’s fourth-biggest bank by market value, gained 4.7 percent in Tokyo after a company official said it plans to expand overseas loans by 32 percent this year. Sony Corp. (6758), Japan’s biggest consumer electronics maker, jumped 2.7 percent. Renesas Electronics Corp. (6723), the world’s largest maker of microcontrollers used in cars, added 3.1 percent after saying its partnership with Taiwan Semiconductor Manufacturing Co. (2330) will help it boost market share. Corn in Chicago fell 0.4 percent to $5.61 a bushel after rising 11 percent in the previous two days on concern that hot, dry weather will curb yields in U.S. growing areas. Gold for immediate delivery rose 0.2 percent to $1,621.40 an ounce. Spain is due to sell tomorrow debt maturing in 2014, 2015 and 2017. While the nation’s 10-year yields eased yesterday, they remain above the 7 percent level that pushed Greece, Ireland and Portugal to seek rescue packages. The so-called kiwi declined after a report today by Statistics New Zealand showed the nation’s current-account shortfall in the three months through March widened to 4.8 percent of gross domestic product, up from a revised 4.2 percent in the previous quarter. The cost of insuring Asia-Pacific corporate and sovereign bonds from non-payment decreased, according to traders of credit-default swaps. The Markit iTraxx Asia index of 40 investment-grade borrowers outside Japan dropped 4 basis points to 176 basis points as of 8:24 a.m. in Hong Kong, according to Credit Agricole SA. The gauge is set for its lowest close since May 8, according to data provider CMA. Corn declined to $5.60 a bushel after rising for two days on concern that hot, dry weather will curb yields in U.S. growing areas. Gold for immediate delivery rose 0.1 percent to $1,620.25 an ounce. NEW YORK (CNNMoney) -- U.S. stocks finished up about 1% Tuesday, as investors breathed a delayed sigh of relief about Greece and were optimistic the Federal Reserve might act to boost the economy at the end of its two-day meeting . "When bad news isn't as bad as you expected, the market reflects that," said Bruce McCain, chief investment strategist at Key Private Bank. The Dow Jones industrial average (INDU) rose 96 points, or 0.8%, the S&P 500 (SPX) gained 13 points, or 1%, and the Nasdaq (COMP) added 34 points, or 1.2%. Sunday's election in Greece yielded a victory for the pro-bailout party and eased fears about the country exiting the euro. Investors are hopeful that Greek leaders will be able to form a coalition government, with the National Bank of Greece (NBG) up 11% and Global X FTSE Greece 20 ETF (GREK) up 6% at the close of European markets. Financial shares were some of the biggest gainers Tuesday. "Bank stocks have been among the most sensitive to the overall trends," said McCain. "Clearly money is moving back toward the risk sector." Shares of JPMorgan Chase (JPM, Fortune 500), Bank of America (BAC, Fortune 500), Goldman Sachs (GS, Fortune 500), Morgan Stanley (MS, Fortune 500) and Citigroup (C, Fortune 500) were up between 2% and 5%. Investors are also optimistic that the Federal Reserve's two-day meeting, which ends Wednesday, will produce another round of bond buying, plans to continue its so-called Operation Twist, or some other type of stimulus. "What we're seeing today foretells the way the rest of the week is going to go," said Doug Cote, chief market strategist at ING Investment Management. "Since we're expecting to see supportive policy out of the U.S. and maybe even out of Europe, the market will get even better." Stocks saw a similar rise after the last Fed policy meeting in April, with the Dow rising about 350 points in the week after the April 24 meeting. 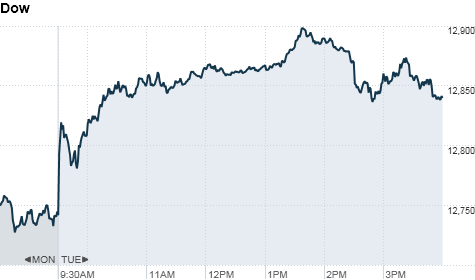 But the boost didn't last; the Dow erased most of its gains by May 7, falling back 270 points. Leaders of the Group of 20 nations were concluding a meeting in Mexico on Tuesday. Europe is at the top of the agenda, though analysts aren't expecting any significant policy announcements. U.S. stocks ended mixed Monday after a day of choppy trading following the election in Greece. But CNNMoney's Fear & Greed index showed investors' level of fear continued to lessen. Economy: In May, home builders filed for building permits at the fastest pace since September 2008, the government reported Tuesday. Permits came in at a seasonally adjusted annual rate of 780,000, easily topping forecasts of 725,000 from economists surveyed by Briefing.com. Housing starts, which are more affected by weather than permits, fell slightly to an annual rate of 708,000, a bit short of forecasts. Companies: Shares of retailer JC Penney (JCP, Fortune 500) tumbled after the company announced late Monday that its president had left. Michael Francis was hired away from rival Target (TGT, Fortune 500) in October to lead Penney's marketing efforts, but in May the company announced disappointing sales that sent its share price sharply lower. Business software maker Oracle (ORCL, Fortune 500) made a surprise earnings announcement after the close Monday, announcing an operating profit of 82 cents a share and a $10 billion buyback. Shares finished the day up 3% on Tuesday. Drugstore chain Walgreens (WAG, Fortune 500) announced Tuesday it was buying a 45% equity ownership stake in Alliance Boots, the Switzerland-based drug wholesaler that is a major global drugstore chain. Shares closed down 5% on the news. JPMorgan Chase (JPM, Fortune 500) CEO Jamie Dimon returned to Capitol Hill Tuesday to testify before the House Financial Services Committee about the bank's $2 billion trading loss. Dimon and regulators debated how institutions like JPMorgan should be monitored. Dimon assured regulators that the bank "can be regulated" and that it is "not too big to fail." FedEx (FDX, Fortune 500) reported earnings of $1.99 a share in its fiscal fourth quarter, excluding special items, topping forecasts. But its guidance for fiscal first-quarter earnings was below forecasts. Shares were up 3% in as markets closed. Financial services firm Jefferies (JEF) reported earnings of 31 cents a share, excluding special items, down from 36 cents a year earlier but topping forecasts. Book retailer Barnes & Noble (BKS, Fortune 500) reported a quarterly loss of $1.08 a share, wider than the loss of $1.04 a share a year earlier. Microsoft (MSFT, Fortune 500) shares edged higher after the software maker unveiled a Windows tablet computer of its own design late Monday. Shares of Pandora (P) fell Tuesday after Spotify announced it was launching a free mobile radio app for Apple's iPhone, iPad and iPod touch. World markets: European markets closed higher. Britain's FTSE 100 (UKX) gained 1.8%, while the DAX (DAX) in Germany rose 1.8%, and France's CAC 40 (CAC40) bounced back from earlier losses to end up 1.6%. Asian markets closed slightly lower, with the Shanghai Composite (SHCOMP) losing 0.7%, the Hang Seng (HSI) in Hong Kong slipping 0.1% and Japan's Nikkei (N225) down 0.8%. Currencies and commodities: The dollar was slightly lower against the euro, the Japanese yen and the British pound. Oil for July delivery settled at $84.03 a barrel, up 75 cents. Gold futures for August delivery settled down $3.90 to $1,623.10 an ounce. Bonds: The price on the benchmark 10-year U.S. Treasury fell, sending the yield up to 1.61% from 1.58% on Monday.